The 5th June is celebrated around the world as World Environment Day. There were a number of celebrations in Madagascar on this day including one at the Tsimbaza Zoological and Botanic gardens in the countries capital Antananarivo. 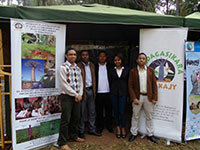 A team from Madagasikara Voakajy had a prominent and well-attended stand at the celebrations where they shared research results from the p4ges project (alongside other activities they have been involved in over the last year). 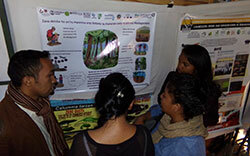 The stand was visited by many dignitaries, school kids and members of the public who looked at posters and demonstrations and watched Malagasy language videos about the p4ges project such as this one on our hydrological research and this one showing our local level community feedback of results.